B cell non-Hodgkin lymphoma is the most prevalent hematological disease worldwide. Enhanced, autocrine IL-6 signaling has been observed in B lymphoma cells from patients, and therapeutic approaches targeting the IL-6 pathway are currently under investigation. However, the molecular events that cause the altered IL-6 signaling are still unknown. Charlotte de Winde, Sharon Veenbergen, and colleagues at Radboud University Medical Center report that CD37 plays a critical role in regulating IL-6 signaling in B lymphoma cells. Using CD37-deficient mice, the group demonstrated that loss of CD37 expression results in spontaneous, multiple-organ lymphoma that consists of IgA+, germinal center-like B cells. Adoptive transfer of CD37-deficient lymphoma cells to CD37-deficient or lymphocyte-deficient recipient mice induced new tumors with metastatic potential. Moreover, loss of CD37 expression corresponded with enhanced IL-6 signaling in B lymphoma cells, as evidenced by increased phosphorylation of the downstream mediators AKT and STAT3 and increased IL-6 production. Mice deficient in both CD37 and IL-6 were protected from lymphoma, further confirming that CD37 regulates the IL-6 signaling that facilitates disease development. The authors determined that CD37 deficiency promotes IL-6 signaling due to loss of CD37 binding to SOCS3, which inhibits SOCS3-mediated suppression of the IL-6 pathway. Evaluation of diseased tissue from patients with diffuse large B cell lymphoma revealed that IL-6 expression is enhanced in tumors that lack CD37 expression, and patients with CD37-deficent tumors exhibited worse overall survival than patients with CD37-expressing tumors. These findings indicate a molecular mechanism that controls tumor-promoting IL-6 signaling in spontaneous B cell lymphoma. The accompanying image shows immunohistochemistry staining of CD37 (red) in human lymphoma tissue (cell nuclei counterstained with hematoxylin in blue). The 4 panels correspond to tissue from 4 diffuse large B cell lymphoma patients. 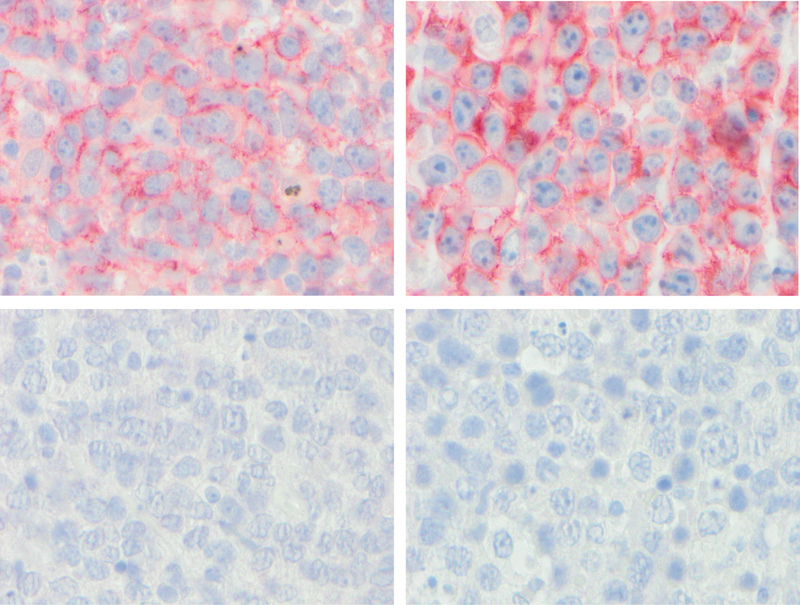 Note that tumors either exhibited ubiquitous CD37 expression (2 upper panels) or lacked CD37 expression (2 lower panels). Citation Information: J Clin Invest. 2016;126(2):653-666. https://doi.org/10.1172/JCI81041. Worldwide, B cell non-Hodgkin lymphoma is the most common hematological malignancy and represents a substantial clinical problem. The molecular events that lead to B cell lymphoma are only partially defined. Here, we have provided evidence that deficiency of tetraspanin superfamily member CD37, which is important for B cell function, induces the development of B cell lymphoma. Mice lacking CD37 developed germinal center–derived B cell lymphoma in lymph nodes and spleens with a higher incidence than Bcl2 transgenic mice. We discovered that CD37 interacts with suppressor of cytokine signaling 3 (SOCS3); therefore, absence of CD37 drives tumor development through constitutive activation of the IL-6 signaling pathway. Moreover, animals deficient for both Cd37 and Il6 were fully protected against lymphoma development, confirming the involvement of the IL-6 pathway in driving tumorigenesis. Loss of CD37 on neoplastic cells in patients with diffuse large B cell lymphoma (DLBCL) directly correlated with activation of the IL-6 signaling pathway and with worse progression-free and overall survival. Together, this study identifies CD37 as a tumor suppressor that directly protects against B cell lymphomagenesis and provides a strong rationale for blocking the IL-6 pathway in patients with CD37– B cell malignancies as a possible therapeutic intervention.